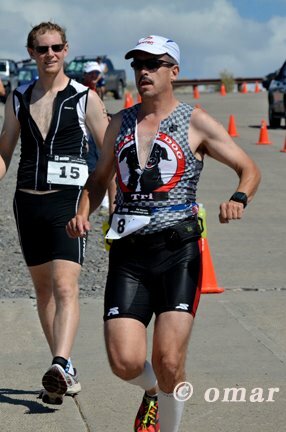 I went into the Tri knowing that I wouldn't be able to run with my IT band issues. This said, I wasn't prepared for the results I saw on Monday. I was leading the age group by 10 minutes after the bike!!! What a freaking rip off. This was probably my one chance to win my age group and I was injured for it! There were three 25-29 year olds signed up who would normally beat me. One didn't show, one moved up to the overall top 3, and one must have flatted judging by the times. Swim: Got battered right away in the water and it continued for nearly a mile. I finally got some space on the 3rd leg of the triangle, but then the next heats started in, and I was back in the fray. I didn't help that I was having trouble swimming straight for the buoys and could only see about a foot in the murky waters. Bike: Good for the most part. The roubaix was great on the bumpy dam road and there wasn't too much wind. I definitely do well on the climbs. After watching people pass me on the flats and the big guys crush the downhills, I took a lot of joy in repassing them. Watched in dismay as a chick in a pink aero helmet road right past me. When I saw the 27 age written on her leg, I did my best to catch back up to try and get a date out of the race, but she was too strong. (Melissa Welker went on to win the overall women's.) I ripped the last downhill into the transition area with particular style because I jumped off the lip onto the boat ramp with everyone watching - probably a few inches of air on a road bike! Run: Came off the bike, GUed, and was fresh to run the 6.2 miles. Almost instantly, knee was killing me. I climbed the hill, back down, watched Tom running his usual, killer 6 min/mile pace, and promptly gave up. Walked the 5 miles into the finish. The old 60+ folks were nice enough to say things like, "you can do it, don't give up" and "I hope you're on your cool-down." I think that sealed it. 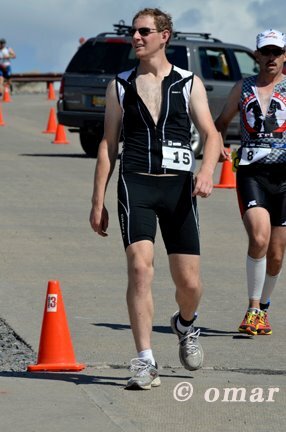 I will be back to exact my revenge on the olympic distance tri community.